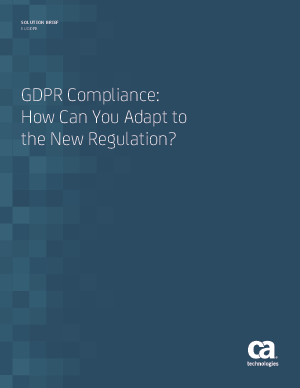 Offers > CA Technologies > GDPR Compliance: How Can You Adapt to the New Regulation? Companies have complied with data protection directives and regulations for more than two decades. But the General Data Protection Regulation (GDPR), an overhaul of existing European Commission data protection legislation, aims to strengthen and unify those laws for EU citizens. Primary GDPR objectives are to give citizens back control over their personal data and simplify the regulatory environment for international business. For organizations already compliant with Directive 95/46/EC, what do they need to do from a technology perspective to comply with GDPR? Read this solution brief to see how CA can help you with GDPR compliance.